Over the past fifteen years, my dear friend Adrian Rooke and I have been annually gathering mistletoe from an apple orchard in Somerset. This has become important and significant to us both, marking as it does a key point in the journey of the sun through the heavens: Alban Arthan or the Winter Solstice. First we perform a simple ritual we have developed together over the years, honouring the land, the trees and the mistletoe. We then take it in turns to precariously climb up the ladder into the gnarled world of old branches hosting the mysterious mistletoe. Mysterious because it is born and lives its whole life between earth and sky. Mysterious because it grows green and produces fruits in the middle of winter when all else fades and dies. Mysterious too because of its ancient Druid name alluding to powers beyond our understanding; ‘All Heal’. For the Winter Solstice just past, it proved mysterious for another reason. Why would a film crew of around a dozen or so travel from California to Somerset to record this event? Yet that is what happened. Morgan Freeman is recording a series of programmes for The National Geographic channel entitled “In Search of God”. These are aimed at examining and exploring different spiritual paths around the globe. It is scheduled to be broadcast in March in the USA and in April in the UK. It felt somewhat surreal for a film crew with all its attendant paraphernalia and distraction to descend upon this normally tranquil field. A field which overlooks the landscape leading south toward Glastonbury and the Isle of Avalon. This is where the mistletoe we gather normally ends up – at the annual Winter Assembly gathering of OBOD – The Order of Bards Ovates and Druids. However, on this occasion we had arranged to re create the event specifically for the film crew on 21st December 2018- the day of the solstice . 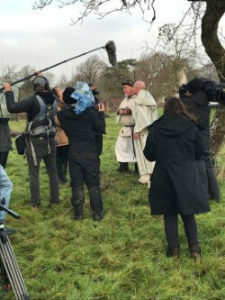 We agreed to take part in this due to the genuine interest and respect for the Druid path, shown by the film director and team. They also joined us for a larger ritual marking the solstice in a nearby stone circle. During this, the mistletoe was honoured and then offered to the earth to ensure future fertility and new life. Hopefully the film will provide an opportunity for people around the globe to gain some insight and inspiration into this nature based path. It shows how Druidry honours and celebrates the mysterious and magical interplay between the Earth, the Sky and the Divine, embodied in the mistletoe at mid-winter. May this mistletoe magic continue rippling out into the world for the benefit of the land and all beings upon it.